So my partner Robert’s school is moving into a spanking brand new building (the sawdust hasn’t even been cleaned off the floors yet), and so all the teachers have been giving up weekends and doing late nights in order to get the classrooms all ready for the early May opening day. Robert teaches 4-5 years old, what is called here in China at many international schools as K1 (K2 being the oldest class of 5-6 year olds, pre K being 3-4, and toddlers being 2-3; yes they go to school that early, I teach a few myself), and his class’s name is Blue Whale, so of course there was going to be an ocean theme to the classroom. Because Robert has a bit of difficulty in the art department, he asked if I could come along and help him and his coteacher make their classroom look nice (more on this in the next post, when I have pictures. I was a little preoccupied this morning to worry about getting pictures). Anyway, each classroom is rather large, has a sleeping area for the children, and is just large enough to have a reading area. 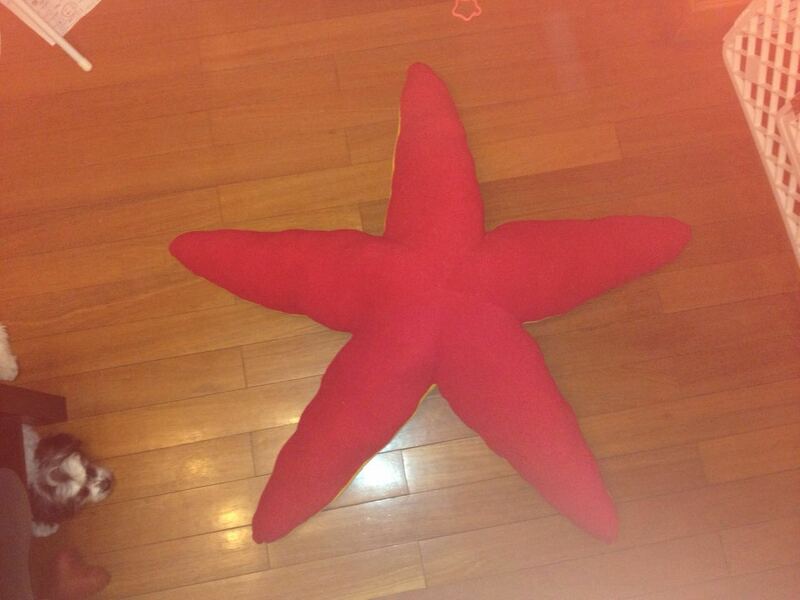 I thought it would be rather fun, and both Robert and his coteacher agreed, would be to have ocean themed floor cushions for the kids to sit on while they read. 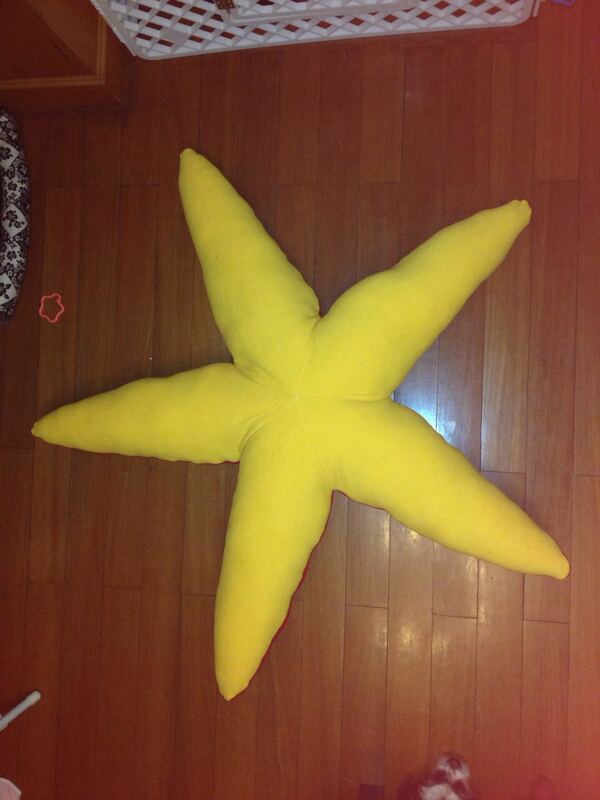 I had some leftover materials from a while ago, fleece that ended up not getting used for its intended purpose, and so I drafted up the first pattern this afternoon, and whipped up this gem of a starfish to take into the classroom tomorrow. His name is Sherman. (P. Sherman, 42 Wallaby Way, Sydney Australia…yes the classroom ended up taking on a Finding Nemo type theme, Marlin, Dory and Nemo all made appearances on the window). First I made a basic oblong diamond pattern, of which you need 5 of each color for each side, or 10 Pieces. 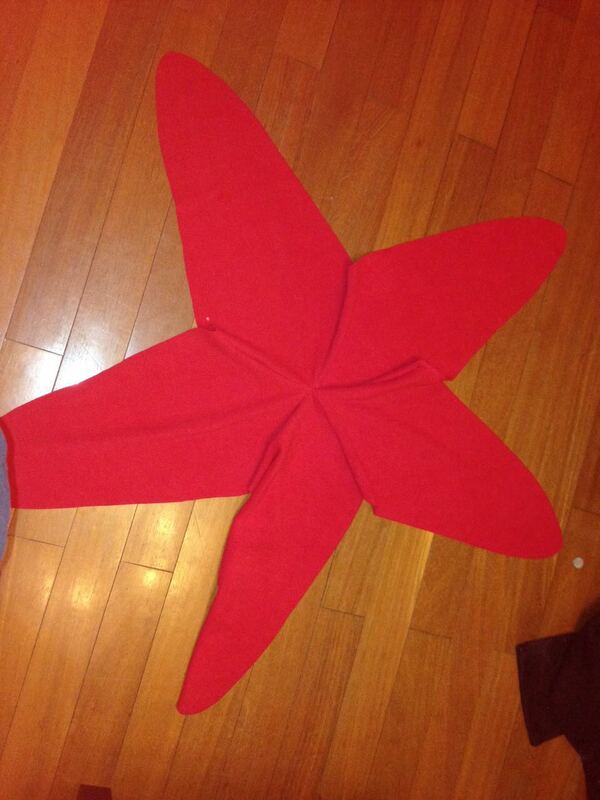 Then you put these two together and sew along the outside edge, leaving an opening to turn the starfish right side out. 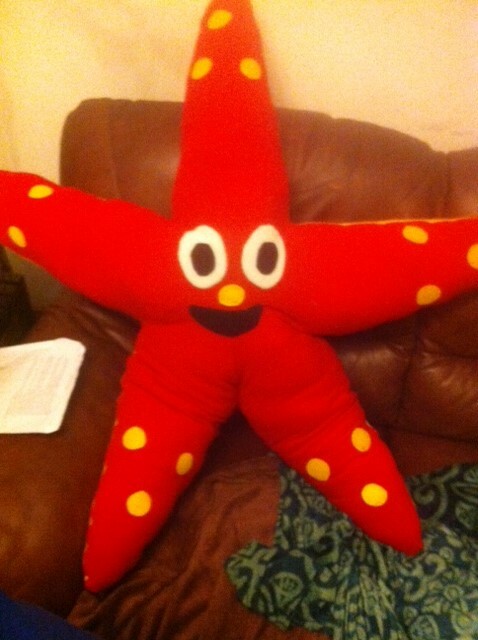 Now because this is for children, I double sewed the seams, once with a straight stitch and once with a zigzag. Not entirely sure if it was necessary, but better to have it done, then to have to fix it later. Once you’re finished stuffing, you’ll get something that looks like this. Lol, my puppy Bodhi is trying very hard not to attack and kill the huge red monster on the living room floor. But that doesn’t mean he won’t try to stare it down. I think I may actually need to put some more stuffing in too, since it’s still a bit floppy in places. But overall I like how he turned out and hope that the children in Robert’s class get a lot of use out of him. From the October 2000 to the summer of 2005, my family and I were lucky enough to live on the island of Maui, Hawaii. While we were there, we experienced a great deal of what is called by locals Aloha, a feeling of love and welcome that characterizes the Islands to their core. The Hawaiian people are such a loving people, and my family and I came to call this place home. Unfortunately we had to leave as my father had to change jobs, but we have tried our best to keep the spirit of Aloha wherever we go. 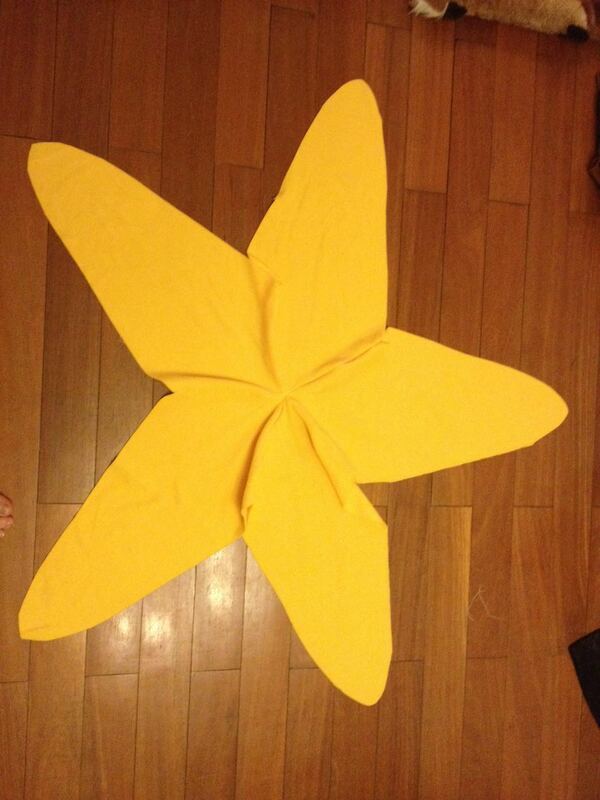 While there, we learned about the art of Hawaiian quilting, and since I’ve been in China, I decided to give it a try. For Christmas a couple years ago, my sister mentioned that she would really like to bring some prosperity into her life, and asked if I could cross stitch her the Chinese symbol for good luck onto something that she could hang in her home. I was a bit intimidated by the idea, so I decided that I would try to do a small wall hanging for her, Hawaiian style. From some of the websites that I visited in doing research for the wall hanging, legend had it that it was a good idea for a beginning quilter to first quilt the ULU or breadfruit, which symbolizes abundance and prosperity, so this is what I chose for her. 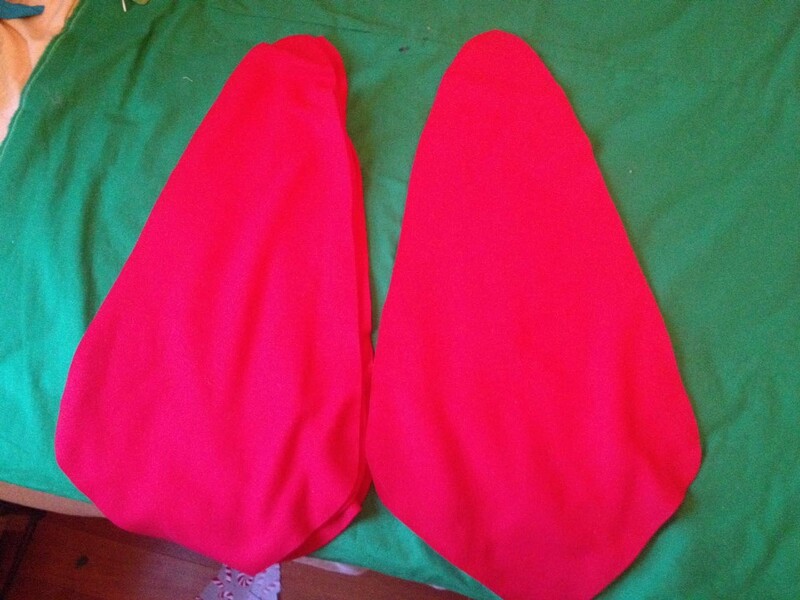 The fabrics I bought on the Chinese ebay, Taobao, where you can find almost anything, and for really decent prices (provided you use Chinese in your search query). It took me a while to find the right colors, but I finally settled on using my sister’s favorite colors. The second image is of the back. I was able to find a fabric that had maps of Hawaii on them, as well as some boats and various island fauna. My sister was thrilled when she got this. And I so enjoyed making this that I decided to attempt to do a full size quilt. Right now, that one is still in the planning phase, but I have the material all ready for when I finally settle on a pattern that I want to do. This one was actually my second attempt, the first was this one.
. This one never got to the quilting stage, as I didn’t have any batting to put between the front and the back, so I just turned it into a regular applique wall hanging. In future posts, I’ll detail the process for the Hawaiian quilt that I’m working on at the moment. Awhile ago, I bought a lot of fleece, thinking that I would be making a bunch of costumes for my partner’s class of kindergarteners. When his coteacher found all of them online, I figured I might as well use the fabric myself. 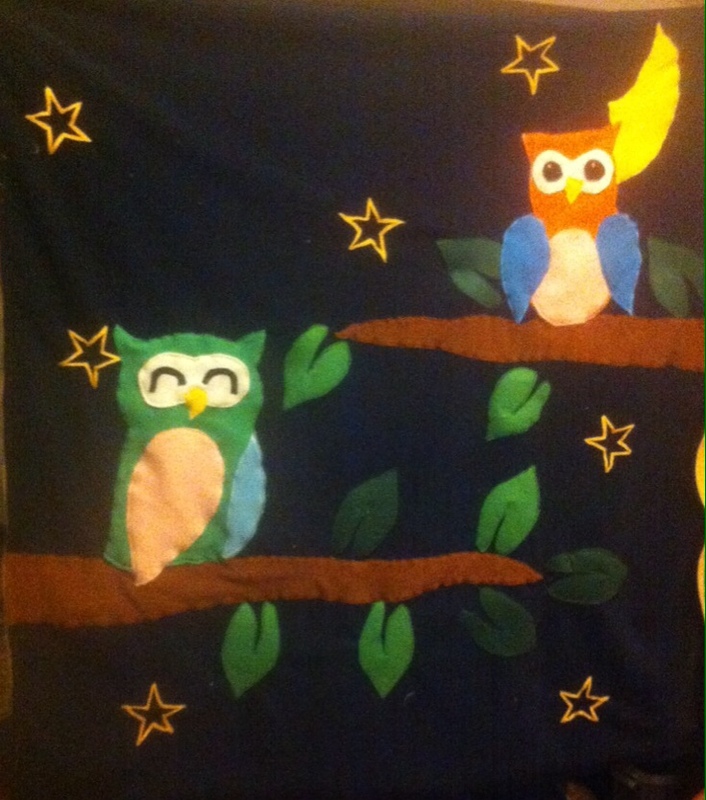 I saw an owl quilt a few months ago and thought that it was the cutest thing ever so I tried to put my own spin on it. The link is to the inspiration for this quilt. And I hope you enjoy my spin on it. My name is Krystal. I’m a fantasy writer, 30 years old, currently living and teaching kindergarten in China, (why do I feel like I’m writing a dating profile, :P). I am very lucky to have my best friend as my partner in this journey of mine, he has been such a comfort and a steady rock when there are bumps in life’s road. My partner, Robert, is also a teacher here in China. He is also a fantasy writer. In my spare time, when I’m not reading or writing, I make toys for my classroom. I am also a beginner quilter, with a few Hawaiian quilts (smaller than wall hangings, though I’m working on a big one right now) under my belt. Oh, my partner and I also travel whenever we can. Since we’re in China, it’s been Asia for the past 5 years. We’ve been to Cambodia and Thailand, as well as seeing both Beijing and Xi’an. If you like anything on my blog, and would like to contact me, feel free to email me. I’m still learning how to do all this so please forgive me if I don’t get back to you quickly. I hope you enjoy my blog. Hello everyone, welcome to Where My Path’s Led! This blog will be a scrapbook of my journeys, both literary and in real life. I hope you enjoy my posts. Thank you for stopping by.